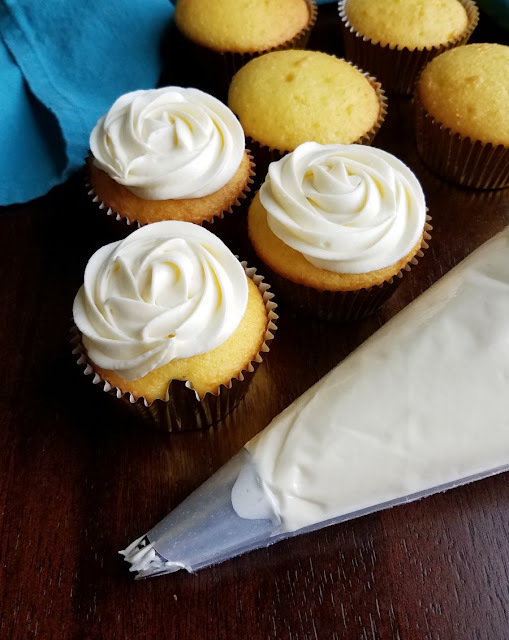 This silky smooth Russian buttercream is made with sweetened condensed milk and flavored with lemonade. 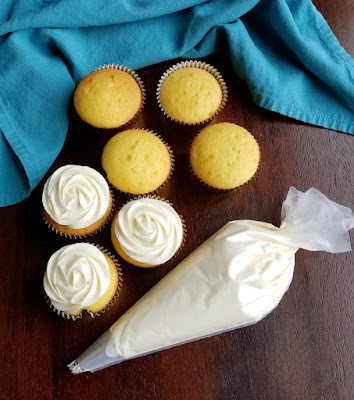 Pipe some on lemon cupcakes for an luscious lemon treat! 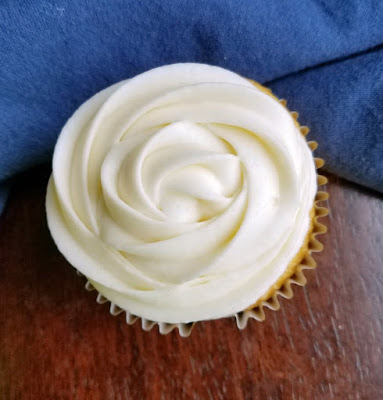 If you are looking for a super simple frosting that doesn't involve any cooking or powdered sugar, Russian buttercream is for you. If you are in the mood to give it a lemonade twist, you are really in the right place! Bake a batch of lemon cupcakes ASAP so you can enjoy this luscious lemon goodness without delay. Russian buttercream has been on my radar for a little while now. It sounds almost too simple to be true. Whip together some butter and sweetened condensed milk. Add a pinch of salt or a little flavoring if desired. That's it! I knew I had to make some for a couple of reasons. First, I am on a quest to try every frosting known to man. You know, I'm doing it for the sake of science. It's totally the chemist in me and not my sweet tooth. Ahem.... totally! Did you believe that? Me either! But in addition to my own wants and needs, I know you guys love a good frosting recipe. We all love it even more when it contains some liquid gold, sweetened condensed milk. 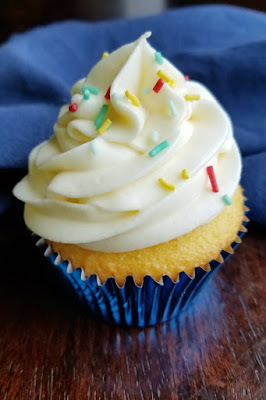 In fact, two of my most popular recipes for the past few months have been sweetened condensed milk buttercream and whipped sweetened condensed milk frosting. Both are absolutely delicious and very different. 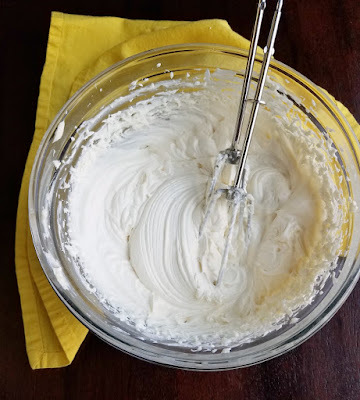 The first sweetened condensed milk frosting recipe to grace my site was the buttercream version. It is made a lot like a traditional American buttercream, so the final consistency can be adjusted and it forms a slight crust. It is the most similar to what I was used to working with, so it remained my favorite for quite some time. 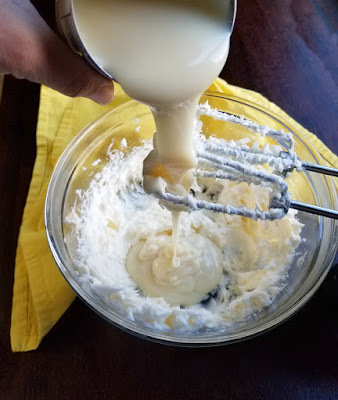 Then a reader suggested a recipe that involved cooking the sweetened condensed milk with some sugar and whipping that cooled mixture with butter and shortening. It is almost like a cross between ermine frosting and buttercream. The result was much less sweet than the buttercream version and super fluffy. It is like spreading a cloud over your cake. This recipe gives us yet another delicious option. It only takes a few ingredients and is super silky. It takes a bit of a cue from its whipped cousin in that it's not overly sweet. It also takes a cue from its buttercream cousin in that it doesn't require any cooking. I had a batch of lemon cupcakes baked for a bags tournament we were hosting. I had also been experimenting with some Christmas cookie recipes, so I wanted to prove I hadn't lost all concept of season. But hey, when you're a food blogger sometimes you have to make stuff well ahead of the actual season! Anyway, I had originally planned on just making vanilla Russian buttercream for the cupcakes. But Little Dude requested we make some lemonade for the party and I couldn't resist adding a bit to the frosting as well. I am glad I did! It added just enough lemon to make the frosting bright and tasty. Plus the lemonade mix is a fine powder, so there was no gritty or grainy texture to worry about. One of my husband's cousins had the first cupcake. She couldn't quite put her finger on what the frosting was made from, but she was hooked. That's just the way I like it! If you are like me and are used to piping with a thicker frosting, chill before piping. 20-30 minutes in the fridge gave it a great texture for piping. Just give it a quick whip before you load up the bag. If it looks like it's separating, keep beating. If that doesn't work, chill it for a bit and then beat again. If the frosting isn't sweet enough for you, you could always add a bit of powdered sugar to taste. I chilled the cupcakes to set them, but they held up great at room temperature. Add about a third of the sweetened condensed milk and beat until incorporated. Continue two more times until the whole can is added. Once the frosting is fluffy, beat in the vanilla and lemonade powder. If desired, chill the frosting and then pipe or spread on cooled cake. I’m all over this, what a great idea to use lemonade mix and well, you had me at the sweetened condensed milk, so simple, yet, I know, bursting with just the perfect lemon flavor! It is super luscious from not having all the extra powdered sugar. It is definitely a must make! I have heard to this condensed milk frosting but probably wouldn't have thought to try it except for now I will! When the Queen of Frostings recommends something, I now it's good. And darnit here I am in the middle of thanksgiving prep and I want to drop everything to make this! It's gonna have to wait but I'm pinning! Thanks Carlee! I had been curious for a while, but wasn't sure how'd I'd like using it. I tend to prefer stiffer frostings, but have been getting more used to piping softer frostings so I thought I'd give it a try. I'm so glad I did! You really should! 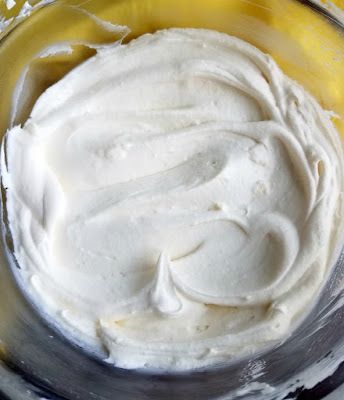 It is such a simple way to make frosting! Sounds really delicious! Does the frosting hold it shape well at room temp? It does. I did chill them for a bit because I was nervous, but they ended up sitting out overnight and thy did great! 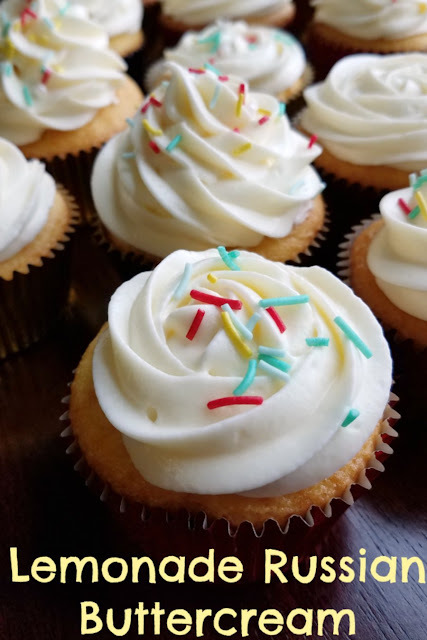 I've been anxious to come visit and see the recipe for your latest frosting! This sounds really really good! It is so simple and silky smooth! Hi Carlee, anything lemony (or chocolatey) is a favourite with me. I'm intrigued by the fact it doesn't contain icing sugar to hold it. It had me curious too, so I had to try it! I was impressed with how it turned out! Keep those frosting recipes coming - one can never have too many!!! This sounds wonderful, no cooking or powdered sugar sound good to me. It does make it super simple, doesn't it? How stable is this buttercream. I am looking to use it for cupcakes and then bring it to work. may be out of fridge about 2 or 3 hours before serving? I was worried about it when I first made it, but it was actually really stable. We had ours out all afternoon and evening for a party and the frosting held up great. I haven't had the frosting out in the summer heat yet, I plan on seeing how that goes this year. But it held up wonderfully for me at room temperature.